The Trans-Siberian Railway or Trans-Siberian Railroad is a set of railways that goes from Moscow and European Russia to the Russian Far East provinces, Mongolia, China and the Sea of Japan. Because Russia is such a big country, travel from one end and the other is an important problem. 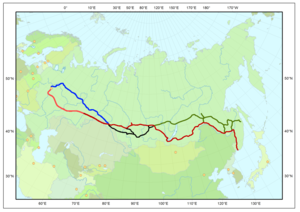 In the 1890s, the Russians began building the longest railway in the world to connect Moscow to the Pacific Ocean. Before the railway was built, the trip took about a year along very rough roads. One reason for building the "Trans-Sib" was military: to transport troops to the East in order to protect the country against Japan and China. Another reason was to transport food from the farming areas of south-western Siberia to the people in the European part of Russia. Many cities and industries are built up along the route of the Trans-Siberian Railway. This page was last changed on 28 March 2015, at 01:40.